Plasmids play a crucial role in all Ilian life forms, not just bacteria-analogues. The segmentation of the genome allows for precise control of expression, selective elimination of harmful mutations, and gene exchange between organisms. In some lineages, such as the red plants and their derivatives, plasmids play a limited role, mostly controlling temporary states such as fertility and metabolism. In others, they are the cell’s dominant control center. In no organism is this more true than the parakaryotes. This ancient and versatile clade has almost abandoned the concept of a nucleus altogether. The true nucleus controls very few functions, mostly related to cell division. 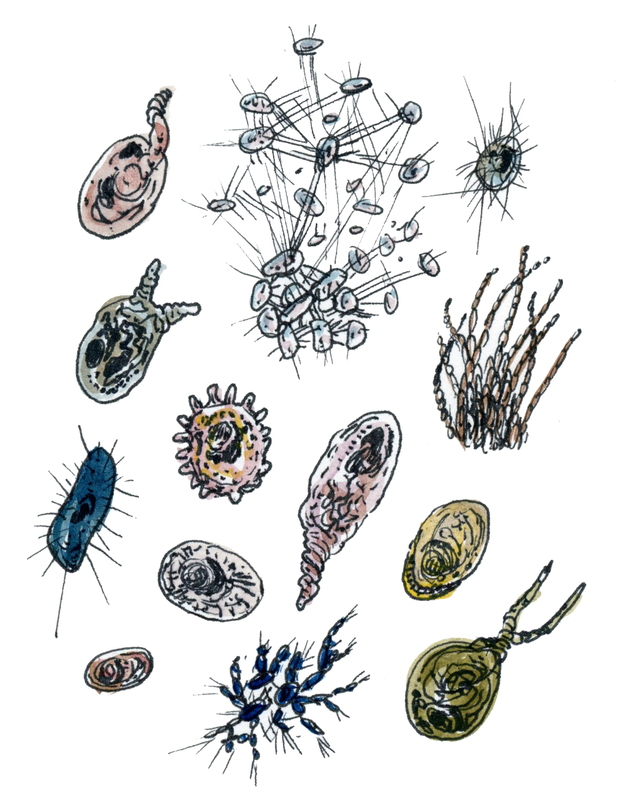 A complex system of plasmids and machinery called the paranucleus does most of the work. It synthesizes a lion’s share of the proteins and acts as an intracellular immune system, protecting the cell from plasmid-viruses and other invaders. Exogenous plasmids that might be beneficial are shuttled to another organelle, known as the Q-zone, which allows them to run out their program in the safety of quarantine. This robust gating system has allowed these organisms to take full advantage of the plasmid system and radiate into an incredibly diverse and ubiquitous category of life on Ilion. Parakaryotes are also known as pseudofungi, and are one of two eukaryote analogs on Ilion. Their cells can be quite big, even macroscopic. They are known for having complex structures of the cell membrane which aid in transport and digestion of solid materials. Some parakaryotes can even produce silk. In reality, the pseudofungus is a farmer. Architect cells lay down the calcium carbonate structures that give the razor reef its name. These normally divide mitotically to produce more of themselves, but waterborne chemical signals induce some of them to differentiate into shepherd cells and harvesters. Shepherd cells are responsible for tending the Dactylia herds. Dactylia agricolarum is another species of pseudofungus that filters decaying matter and plankton out of the water and concentrates it in finger-like protrusions of the cell membrane. Harvesters pluck these off and feed them to the architect cells so they can continue to build and reproduce. In this image, all three cell types are visible. Architects are secreting a combination of minerals and glue to build up the structure’s edge. When they are near death, their cytoskeletons will harden into diamond-shaped barbs that give the razor its cutting edge. A single harvester (middle left) is in the process of swallowing a D. agricolarum finger with one of its antennae. This one is eating for itself. If it were harvesting for the architects, it would attach the fingers to membrane proteins specialized for this purpose. Meanwhile, the shepherds are busy fending off a predatory bacterioid that is plaguing their herd. They do so by cleaving off individual cells and flinging them into the current. 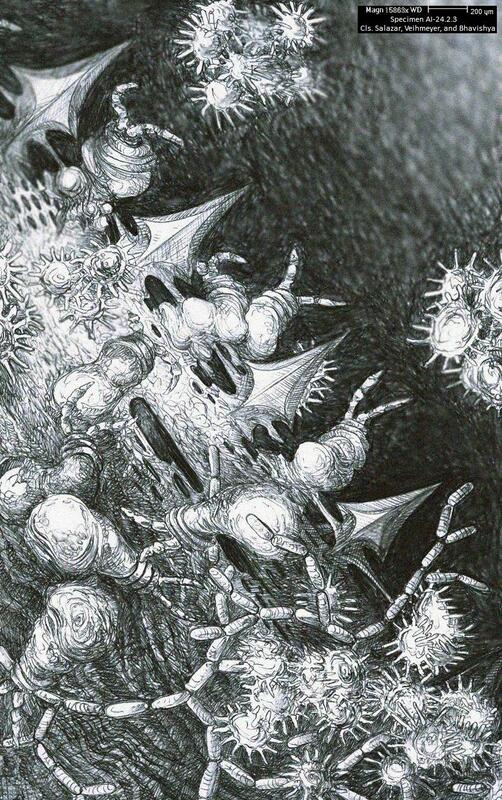 The bacterioids don’t mind this treatment, however; it helps them disperse.